Males and minorities are the fastest growing demographic in cosmetic facial surgery. Although my cosmetic facial surgery practice is about 90% female, males continue to be a growing group. There are many reasons for this. First of all, many more people are openly having cosmetic surgery than in the past as it has become an accepted practice. So as there are more females seeking cosmetic surgery, there also more males. In previous generations, cosmetic surgery was a close guarded secret of the upper and middle class patients. Patients would wait till they looked older before having surgery and would often secretly sneak off and have a drastic procedure that oftentimes looked unnatural. Today’s patients do not want to wait to get old to look young! Therefore they are seeking smaller procedures at a younger age to stay young and avoid the overhaul their parents had. Whereas cosmetic surgery was a stigma in the past, people (including celebrities) are much more open about it now. Males present different challenges for cosmetic surgeons. They are sometimes a little embarrassed to talk about their cosmetic deficiencies and don’t want their friends to know what they are thinking or doing. They also present a different surgical challenge. Men have thicker and bearded skin and do not have the long hair that many women have to hide incisions. Men also do not wear makeup so their recovery may be somewhat longer that a female who can cover bruising, etc. They are also more resistant to “lying around the house” for a week to recover , and will frequently try to return to exercise, sports and work prematurely. Finally (and sorry guys) they are more resistant to closely following post operative instructions than women. The biggest growth I have seen in males concerns minimally invasive cosmetic procedures such as Botox and wrinkle fillers. These simple and effective treatments can provide relatively dramatic results with little or no down time. Male patients are also good candidates for smaller surgical procedures such as cheek and chin implants and chemical peels and lasers. Cheek and chin implants are an attractive option for males as they can not only restore volume to make a patient look younger, but can also give a man a more masculine appearance with relatively simple procedures. My most common surgical procedures in males include eyelid surgery and facelift. This is a common combination in males wishing to rejuvenate their upper face and tighten their neck. Skin care has also proven to be of increasing interest in male patients. Most guys are not interested in a collection of potions and lotions that require morning and evening use, but tend to do really well with simple creams of Retin A and bleaching medication such as Triluma. There is so much science proving the ability of these simple prescription care products to keep patients looking younger, it is hard to dispute their effect. Due to this, men as well as women can get good results by using some simple skin care and sunblock. In previous generations, cosmetic facial surgery may have been for “sissies”, but today’s men want to look as young as they feel and the stigma is gone. 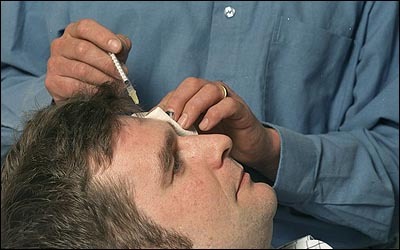 For more information about cosmetic surgery in males or other cosmetic facial surgery procedures, see www.lovethatface.com.